"And They Were Concerned About Beer and Cigars"
Rowdy curling crowds; spontaneous street parties; public drunkeness. You don't have to look far for evidence that the crowds at Winter Games in Vancouver know how to have a good time. And, as if anymore proof is needed that a wild Olympic atmosphere permeates B.C. 's largest city, now there's an apparent condom shortage. That's right. As you read this, an emergency shipment of condoms is desperately making its way across Canada to the West Coast city. Health officials in Vancouver have already provided 100,000 free condoms to the roughly 7,000 ahtletes and officials at the Games. That's about 14 condoms per person. But as of Wednesday, those supplies started running dangerously low. 14 per person? They ain't married! That's all I can say. The Governator has a sense of humor and it showed when he made a public statement regarding the potential for an NFL team to come back to Los Angeles. Gov. Arnold Schwarzenegger, who in an interview in November noted he is "from Los Angeles" and the Coliseum is a "great state property," suggested there was "enough room" in Southern California for two teams. ...Schwarzenegger, in a light-hearted comment, underscored the ongoing drama since 1994. Referring to his movie roles, he said his four children — ages 16, 14, 12 and 8 and eager for NFL football — "think that I can do anything, that I would just come here and make this happen. "Because they've seen the movies, blowing up buildings and wiping out armies and conquering witches and even the devil and they think Daddy is going to just go there and ... bring some teams back." Of course we're not talking about witches, devils, or an army of devils and witches. We are talking about a monopoly league with huge barriers to entry into the club. Since then (the beginning of competition in the WBC) they have drawn protests, nearly sparked a brawl, suffered their most lopsided loss in 23 years and blown off the mandatory interview sessions with the media three times in five days. This behavior makes Barry Bonds appear like Mother Theresa. If this behavior came from Major League ballplayers, there is no doubt we'd be hearing about spoiled, rich players. But my guess is that there ain't exactly free agency in Cuba and the Cuban players ain't exactly rich. Yet that (David Ortiz's monster shot) was nearly overshadowed by what happened off the field, where anti-Castro protesters flocked to Hiram Bithorn Stadium by land and by air, causing the Cuban team to sneak out of the ballpark in a huff and angering tournament officials whose patience with Cuba's antics ran out long ago. ...But the turning point -- on the field and in the stands -- came six innings earlier (3rd inning) when the Dominicans scored four third-inning runs on two hits, two walks, a hit batter, a balk and a Cuban error. Shortly afterward, a single-engine Cessna made two passes over the stadium trailing a banner reading Abajo Fidel (Down with Fidel). Things were just starting to heat up, though, because in the bottom of the inning a group of 10 protesters sitting in the second level behind home plate stood and removed their shirts to reveal T-shirts, each printed with one letter, that spelled out the same slogan. ''This is a good opportunity to show the world that we want free elections in Cuba, the same thing as in the U.S.,'' said protester and Cuban exile Carlos Leal. ...It was the second time in Cuba's five games that anti-Castro demonstrators have protested inside the ballpark, but the first since Major League Baseball and San Juan promoters established a ''code of conduct'' prohibiting political protest in an attempt to placate the Cuban delegation. 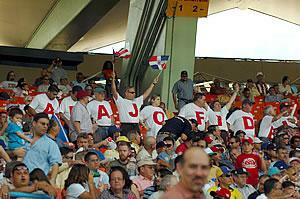 Last Thursday a Cuban exile named Jose Garcia held up a sign reading Abajo Fidel during Cuba's second WBC game, sparking an emotional response from the Cubans who threatened to pull out of the tournament without a ban on anti-Castro signs. At least Cuba didn't threaten to pull out of the tournament again. But then it might not have to. If it loses its Wednesday game to Puerto Rico -- which beat the Cubans 12-2 in a first-round game stopped after seven innings by international baseball's mercy rule -- their WBC stay is likely over. Yet even then the Cubans might not go quietly. In that first-round game Cuban pitchers, who have a reputation as head-hunters, fired fastballs over the heads of Puerto Rico's Pudge Rodriguez and Ricky Ledee, drawing angry stares from both. Puerto Rico's Jose Santiago responded by hitting Cuba's Juan Moreno, earning an ejection for himself and manager Jose Oquendo. It would be a shame to see a player get DL'd because of some sort of political statement made by an opposing player via an inside fastball. Did anyone bother to get a focus group together to ask Cubans how they feel about the protests? We certainly don't want to hurt anyone's feelings. For more on the incentives of hit by pitches, see this by JC at Sabernomics.